Dr. M.M. Pallam Raju, Hon’ble Minister of Human Resource Development visited Mauritius on 19th-20th November, 2013. During the visit, Dr. Pallam Raju paid a courtesy call on the Hon’ble Prime Minister of Mauritius, Dr. Navinchandra Ramgoolam and held bilateral meetings with the Minister for Tertiary Education, Science and Research, Dr. R. Jeetah as also with Minister of Education and Human Resources of the Republic of Mauritius Dr. Vasant Kumar Bunwaree. Two MoUs were signed during this visit. The first MoU is between IIT, Delhi and Mauritius Research Council for setting up of an International Institute of Technology Research Academy (IITRA) in Mauritius. The aim of the IITRA is to provide world class research based educational platform for full time and part time post graduate research leading to MS(Research) and Ph.D. degrees to be awarded by IIT Delhi in identified areas (clusters). IITRA aims to attract foreign researchers and students to Mauritius, mainly from Africa and Asia and build core research infrastructure including faculty and facilities. In the initial phase spanning a period of 5 years, IIT Delhi will help IITRA to build a core research facility including research infrastructure and capacity. It is expected that 6 clusters will be implemented with a total of 25 faculty members and some 50 research scholars. IIT Delhi will provide the required academic leadership necessary for setting up the IITRA, partnering in defining the research and education agenda as well as help recruit faculty and admitting students as per norms of IIT Delhi. 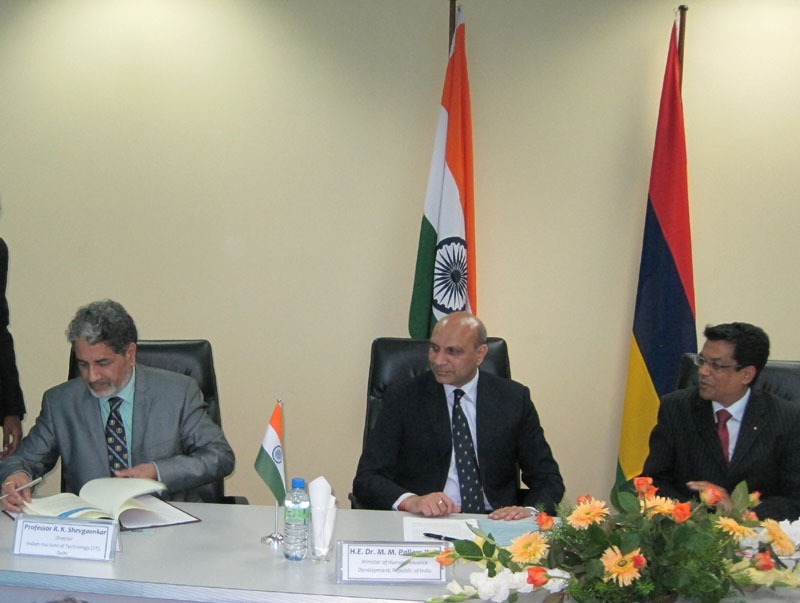 The other MoU between Association of Indian Universities (AIU) and Tertiary Education Council (TEC) of Mauritius for mutual recognition of educational qualifications was also finalized and signed. The MoU will ensure that both parties facilitate the mutual recognition of higher education qualifications awarded to students in Mauritius and India. Both AIU and TEC would advise higher education institutions in their countries on the provision of higher education and the comparability of qualification with the aim of facilitating academic mobility and cooperation. They will make available information on currently recognized higher education institutions in their respective countries. During discussions, Dr. Pallam Raju emphasized that the future of humanity lies in the desire as well as capacity of knowledge societies to share and support each other and this can materialize only if nations come together for new knowledge generation. Both Ministers in charge of education in Mauritius expressed satisfaction at the vibrant engagement between the two sides in the field of education and hoped that the two MOUs signed will further strengthen the collaborative efforts. Dr. Pallam Raju renewed his commitment to collaboration and partnership in higher education, which was equally reciprocated by both the Ministers of Mauritius. Minister R. Jeetah thanked Minister Raju for India’s cooperation in the field of education, especially that of IIT-Delhi, in setting up an International Institute of Technology Research Academy, the first of its kind in Mauritius. The UGC will facilitate linkages with higher education institutions running Oceanography related programmes and research in Ocean Studies. Joint research programmes such as resource mapping and the holding of workshops in collaboration with institutions dealing with ocean studies will be considered. Collaboration with the institutions will be facilitated for exchange of researchers, academics and faculty members to develop higher education programmes in the area of Petroleum Engineering/Chemical Engineering. Support of Ministry of HRD will be provided for E-learning and sharing of open education resources developed in India. Collaboration of IIT, Delhi will be extended to University of Mauritius for cyber security and cyber systems programmes. A Steering Committee will be set up to monitor the implementation of the project. The Committee will hold discussions through video conferencing to develop an implementation schedule and time frame. IIT, Delhi will help identify the Director of the IIT Research Academy of Mauritius. Research students will start undertaking their research at the Academy in June, 2014. Dr. Pallam Raju also visited the Apravasi Ghat and Kewal Nagar (Birth Place of the Father of the Nation of Mauritius, Sir Seewoosagur Ramgoolam) to pay his tributes. On the sidelines of the official meetings, Chairman, UGC met with Executive Director of the Tertiary Education Council of Mauritius and clearly explained the provisions of law which need to be followed by the Indian institutions operating in Mauritius.